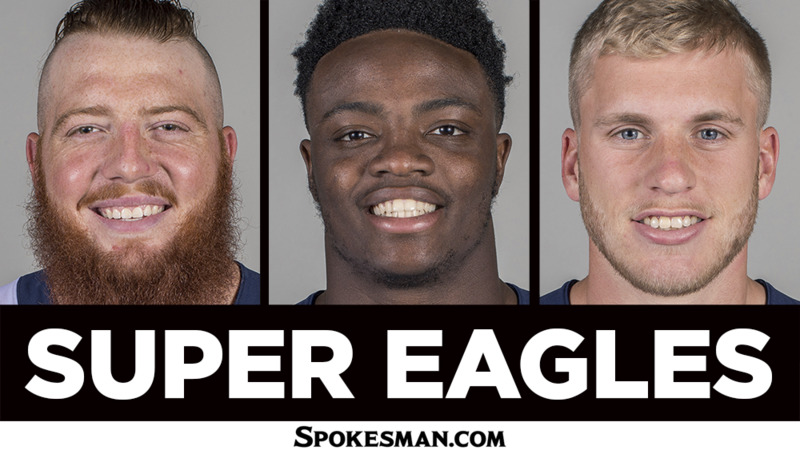 A trio of former Eastern Washington football stars – each a member of the Los Angeles Rams – are headed to the Super Bowl. Second-year linebacker Samson Ebukam had three tackles and a forced fumble, helping the Rams clip the New Orleans Saints 26-23 in overtime Saturday in the NFC championship game at the Superdome. Wide receiver Cooper Kupp, drafted by the Rams in 2017 with Ebukam, was inactive Sunday due to a season-ending knee injury he suffered in early November. Another former EWU standout, offensive lineman Aaron Neary, is on the Rams’ practice squad. The Rams will face the New England Patriots in Super Bowl LIII on Feb. 3 at Mercedes-Benz Stadium in Atlanta. Ebukam, Kupp and Neary made the trip to Frisco, Texas, during their playoff bye week Jan. 5 to watch EWU face North Dakota State in the FCS national title game. A starting outside linebacker, Ebukam has 25 tackles this season along with three sacks, three forced fumbles and an interception. Ebukam praised his defense Sunday for pressuring Saints quarterback Drew Brees, who had success when finding running back Alvin Kamara out of the backfield. The Portland native had the best game of his young career in Week 11 when he scored two defensive touchdowns – an interception and a fumble return – in a 54-51 win against the Kansas City Chiefs on Monday Night Football. Ebukam was a first-team All-American at EWU in 2016 and finished his college career with 44 tackles for loss and 24 sacks. He was a fourth-round draft pick. Before Kupp went down with a season-ending knee injury, he was one of quarterback Jared Goff’s favorite targets, hauling in 40 passes for 566 yards and six touchdowns in eight games. Kupp set a Rams rookie receiving record in 2017 when he caught 62 passes for 869 yards and five touchdowns. He was a third-round draft pick. At EWU, Kupp, from Yakima, broke the FCS career receiving record in 2016, finishing his decorated tenure in Cheney with 6,464 yards and 78 touchdowns. His brother, linebacker Ketner Kupp, led EWU in tackles this past season. Neary, who grew up in Richland, has been primarily a practice player since entering the league in 2016 as an undrafted free agent. He earned his first NFL start in Week 17 of the 2017 season when the Rams rested their starters. At EWU, Neary was a two-time All-Big Sky Conference selection and was a second-team All-American in 2015. Published: Jan. 20, 2019, 9:44 p.m. Updated: Jan. 20, 2019, 10:51 p.m.